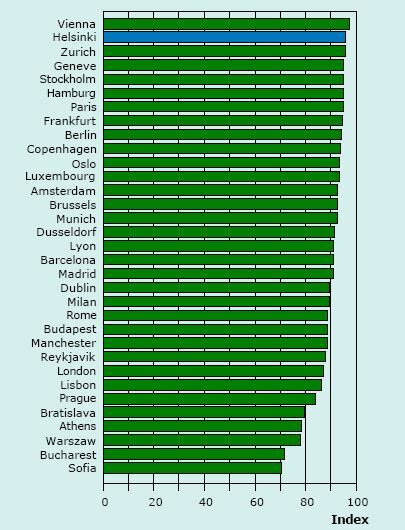 The City of Helsinki Urban Facts has published several comparative studies 1 of European metropolises since 2003. All these studies were based on the regional data and forecasts produced annually for the European Regional Prospects study by the European research network led and coordinated by Cambridge Econometrics. The viewpoints were the trends of production (Gross Value Added), employment and population, in connection with economic structures and sizes of the major urban regions in Europe. In all these studies, the Helsinki Region, together with other Nordic capitals and Baltic Sea cities, were placed in the framework of the European urban network. The reference group of European metropolises consisted of capital regions and other selected economically significant metropolises from EU countries, Norway and Switzerland. Unfortunately, the production of European Regional Prospects ceased after 2010 and the database and forecasts have not been available since then. However, there is still much interest in the various topics of economic structures and trends, competitiveness, living conditions and regional networks from the point of view of urban regions. This is especially interesting in this time of Europe-wide economic turbulence strongly affecting the economic and regional environment in most countries and influencing the operations of enterprises and the choices of inhabitants, such as migration. In this study, we analyse the regions of Europe from several viewpoints: size, demographics, migration, production, income, density, urban transport and factors of competitiveness and welfare. We use statistical data from Eurostat databases and selected additional data sources, such as the Economist Intelligence Unit. Compared with earlier studies, we have produced a broader view of the characteristics and differences of the regions of Europe, but we cannot provide forecasts for future years, as we were previously able to do. 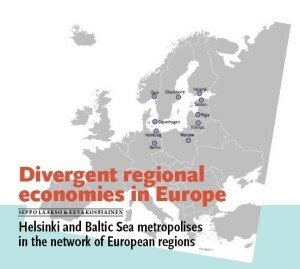 Our main interest is to consider the Helsinki region and other Baltic Sea city regions as part of the European urban network by locating them in the distribution of regions with respect to various economic and social dimensions. The pull of the most successful metropolises is maintained by their ability to create and cumulate human capital based on knowledge, expertise and social skills. This cannot be created simply by investing in physical capital while it is also necessary. However, diversified communication possibilities have become an important factor as a part of accessibility, in addition to transport systems. An important feature of the urbanisation of the last years is growing international interaction in terms of travelling, immigration and trade. These international flows have grown fast due to integration, lowering of borders and improved transport and communication and are also strongly concentrated in metropolises. 1 City of Helsinki Urban Facts 2003, 2004, 2005, 2006, 2007, 2008 and 2011.